The Sucking Pit was first published in 1975 and, with a length of just 111 pages, the entire book can be easily read in just one sitting. Most of the story is set in a place called Hopas Woods, which is described in the early pages as being 200 acres of conifer plantations on the edge of the industrial midlands. The reader is also told that the woods have a rather nasty history and some pretty evil deeds happened within its green and leafy depths; which has given rise to some rather unusual names for certain parts of it. There is, for instance, the Hanging Wood, where Oliver Cromwell was reputed to have hung more than a hundred Royalists. Then there is The Devil’s Dressing Room, a place where, legend has it, the Devil paused on one of his visits to earth, while he changed into human form. Only the gypsies go there now. Then there is The Sucking Pit that gives the book its name. The Sucking Pit is a bottomless bog that is apparently quite a handy for disposing of dead bodies. In the early pages of the book, the reader is introduced to a rather evil man named Tom Lawson. Tom is of Gypsy descent and he lives alone in a cottage in the woods, where he works as a woodsman. Tom has not always lived alone. He used to have a beautiful, young wife called Marie. She was much too young for him though. The old man could never manage to keep up with her demands; so Marie sought relief elsewhere. She now rests in the depths of the Sucking Pit, along with one of her lovers. Tom is definitely not a nice man and he is quite well versed in the darker secrets of gypsy magic, a lot of which he has written down in a little black book that he keeps beside his bed. All the magic in the world cannot help Tom though when his heart decides to stop pumping. He is found by his niece, Jenny. She also finds his little black book and although Jenny appeared to be a pretty normal girl up until that point, she goes off the rails pretty quick once she starts delving into the secrets of Tom’s little black book. In fact, when she sees the recipe for a magic potion that makes the person who drinks it ‘strong and powerful’; Jen rushes out straight away and murders the necessary ingredients: a hedgehog and a shrew. She also murders her uncle’s cat for no other reason than it gets in her way. Then before you know it she is mixing the blood together and drinking it while the moonlight glints off her naked skin. Never mix your drinks—especially if you are drinking either shrew or hedgehog’s blood. Think twice about spending time with any girl who is willing to drop her duds for only two quid. Does all of this sound a little unbelievable to you? It did to me and it only gets worse as the story progresses. Jenny is probably the main character in the book, but she is next to impossible to like. Sadly, so are all the other characters. The Sucking Pit seems to be a book that is more idea-driven than anything else. The characters are just there to populate the story and never really get the chance to come to life or become likeable and fail to behave like real people. When Jenny decides to move into her Uncle’s cottage and Sir Clive comes to evict her, not only does he not evict her, but he seems quite happy to knowingly accept sloppy seconds and jump into bed with her. Then, just a few pages later, he is so madly in love with Jenny he has written her into his will so that his wife cannot throw her out of the cottage if he dies. A married man that has a problem keeping his flies done up? Okay, it happens, I can believe that, but the rest of it was just a little bit too over the top for my tastes. I let it go though. After all, Jenny was no longer a normal woman. She’d been drinking hedgehog’s blood in the moonlight. The Sucking Pit is not, by any means, an unbearable read, but it does not have a lot going for it and if I had to give it marks out of ten, I could only give it three at the most. 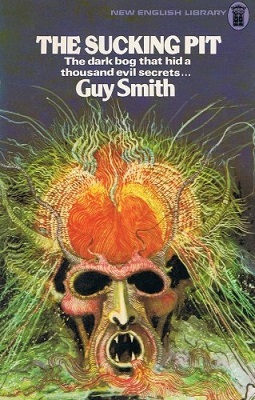 If you want to read a good Guy Smith book, I suggest you go with Manitou Doll instead.